"That man is not what he seems." Eugene Lenormand (Ian Holm) arrives in Paris as an unknown figure and becomes involved through chance with a group of affable fruit sellers. Standing in front of detailed city maps posted on the wall, he explains his battle plan for achieving maximum sales. The audience stares in wonder at his ingenuity and abilities to rouse them into action. You see, these effective traits originate from his actual identity�Napoleon, the former emperor of France. Escaping from his forced exile at St. Helena, the small man has returned to regain his position. Due to odd circumstances, however, his new occupation may cause Napoleon to reconsider his original priorities. Based on the 1992 novel The Death of Napoleon by Simon Leys, The Emperor's New Clothes presents the theory that Napoleon did not die in exile at St. Helena. Instead, he participated in an elaborate plan to pose as Lenormand and travel by ship towards France. After being partially detained in Antwerp, he travels across the countryside to Paris with his ambitions riding high. During the journey, Napoleon even stops at Waterloo and observes souvenirs of his past defeat. This comic sequence includes a clever moment with the former emperor sleeping below a sign that says "Napoleon slept here." These fun scenes raise the story above the typical romantic costume drama. While following a pretty straightforward format, the interesting screenplay keeps the events lively. While attempting to meet his contact (who is unfortunately deceased) in Paris, Napoleon becomes surprisingly attached to Pumpkin (Iben Hjejle, High Fidelity), the soldier's widow. This connection may lead him to forsake plans of regaining his throne. Would a simpler life with Pumpkin be so terrible? Definitely not. Complications also ensue when the actual Lenormand (also Holm) refuses to acknowledge that he is not the Emperor Napoleon. He spends his days at St. Helena gorging himself on fine food and inventing lurid stories for his memoirs. Meanwhile, the real Napoleon faces internal struggles and even buys a costume and starts wearing it around the house. Of course, no one believes his claim to the throne, which could lead to eventual madness. Ian Holm (Lord of the Rings: The Fellowship of the Ring, The Sweet Hereafter) shines in the dual role and creates two unique individuals almost solely through his mannerisms. The actor has exhibited wonderful talent in a wide array of roles throughout his career, and it's refreshing to see him receive a leading role. Hjejle also does an impressive job in making Pumpkin seem believable as a soldier's wife. While Holm is 40 years her senior, their moments have a surprising tenderness that makes them believable. The supporting cast (especially the young boy) all play their roles nicely, even while receiving limited screen time. Tim McInnerny does well playing the jealous Dr. Lambert in an underwritten part. The Emperor's New Clothes is a sweet, enjoyable picture that benefits greatly from Holm's top-notch lead performance. Director Alan Taylor has developed significant experience on some of television's most heralded series, including Homicide: Life on the Street, The Sopranos, and Six Feet Under. His straightforward approach here lacks the visual flair often seen in those shows, but it mostly works for the material. There are some impressive scenery shots, and the personal moments work effectively. While not a groundbreaking comedy, this tale does provide an entertaining experience. Image Transfer Review: The Emperor's New Clothes appears in a decent 1.85:1 anamorphic widescreen transfer. Its picture contains few defects or specks throughout the presentation. Especially impressive are the picturesque outdoor moments in the French countryside, which showcase excellent colors. The only drawback of this transfer is a decent amount of grain and less clarity during the night shots. Everything is still easy to follow, but it lacks the premier quality of the other moments. Audio Transfer Review: This disc utilizes an effective 5.1-channel Dolby Digital transfer, which conveys Rachel Portman's enjoyable score nicely. The music resonates from both the front and rear speakers, which creates an enjoyable viewing atmosphere. While not a super-power audio track, this transfer presents a significant amount of complexity. Also, the dialogue is easily understandable throughout the feature. This release also offers a 2.0-channel Dolby Surround track, which matches its counterpart almost entirely and gives only a slightler lesser experience. Extras Review: This release contains no extra features except a skimpy 15 chapter cues and English subtitles. It would have been interesting to learn more information from historians about Napoleon's actual life and Simon Ley's novel. When I originally viewed the previews for The Emperor's New Clothes in theaters, I found the idea compelling. 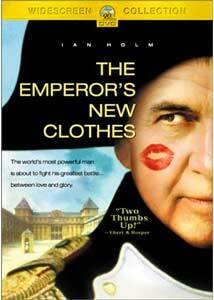 Numerous ideas for comedy exist within this clever tale, and Ian Holm looked right for the part. The final result does fall a bit short in terms of silliness, but it exceeds my expectations in dramatic terms. While not a complete success, the story is definitely worth a look.